Meet Susie at Homeward Pet today! Photo courtesy of Homeward Pet. Rainy days are coming, it’s a fact when you live in the PNW, but our dog of the week Susie can help brighten up those cloudy days! 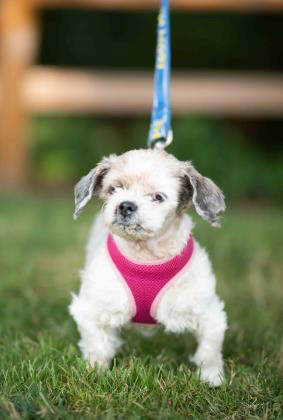 Susie is an adorable 13-year-old Shih Tzu mix with a face that radiates sunshine. This sweet lady is looking for a cozy home where she can snooze away the days and go for leisurely strolls around the block. She will be a wonderful couch companion when it’s movie time, and a lap warmer when it’s naptime. We don’t know if Susie’s met other dogs or cats before, so slow introductions are recommended. If you’re an adult only home, with cuddly blankets and a lot of love to give, then Susie will be the perfect addition to your family. Come meet her today!